A computer hard disk. Credit: Sergey Granev, via Shutterstock. Want to learn more about the data storage of the past, present, and future? Check out File Not Found on Methods, From Science Friday. 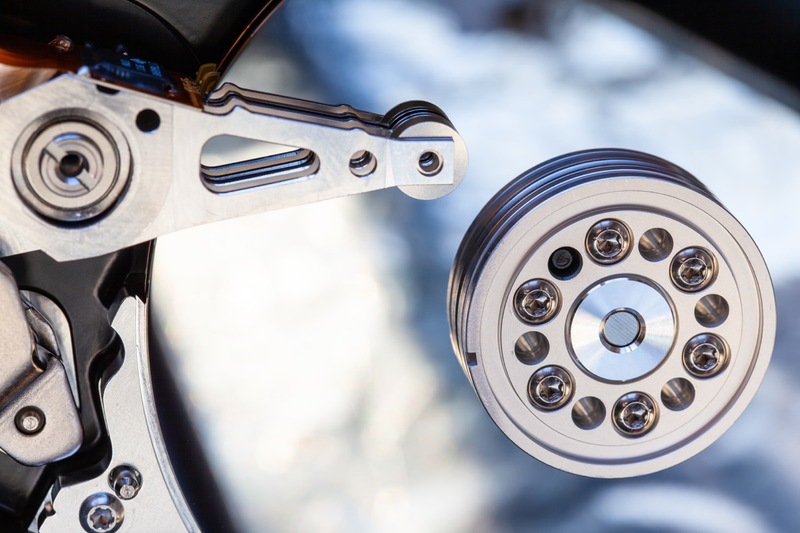 Hard disk drives were developed in the 1950s and we’ve relied on them ever since to store digital data. But the amount of information that can be stored on a drive has plateaued. Now, two rival data storage companies are testing two different methods of expanding storage. In one corner, Seagate is researching how to use lasers to expand storage. In the other, Western Digital is experimenting with a device called a pin-torque oscillator. Amy Nordrum, news editor for IEEE Spectrum, talks about that story, as well as a proposed new high energy particle collider and the physics of hagfish slime in this week’s News Round-up. Learn about other future methods of data storage, like DNA or crystals, on Methods, From Science Friday. Listen to an exit interview with DJ Patil, the nation’s first chief data scientist. Amy Nordrum is News Editor at IEEE Spectrum in New York City. IRA FLATOW: This is Science Friday. I’m Ira Flatow. Later in the hour, we’re going to talk about the Green New Deal. What are your thoughts on turning our economy towards green tech? What would you like to talk about? You make the call, but only if you make the call. Our number– 844-724-8255, or you can tweet us @scifri. But first, consider the hard disk drive. It’s been around since the ’50s. But the hard disk drives are running up against a storage problem themselves. Scientists are looking into how we can put more data onto the magnetic material inside these disks. Amy Nordrum is the news editor at IEEE Spectrum. She reported this story. Here to fill us in on that and other short subjects in science, welcome back, Amy. IRA FLATOW: So what’s the problem with our hard disks? AMY NORDRUM: Well, hard disks store information in tiny magnetic grains. There are trillions of these grains on a disk, and they’ve gotten to be very small over the years. But in order to make them even smaller, engineers have run into a problem in that these grains are typically flipped with a magnetic force that comes from the drive itself and magnetic field. But now, because they’re so small, they’re able to actually just flip due to ambient energy in the air, which is not what you want if you’re making a hard drive, because that can wipe out data. IRA FLATOW: I hate it when that happens. AMY NORDRUM: Yeah, it’s a problem. So we’ve had to switch to new materials, which are hard– which make it harder to flip the individual grains. Then the drive manufacturers themselves– in this case, I reported on Seagate and Western Digital. It had to come up with new technologies that make it easier to flip these hardened grains. They are very, very small, smaller than ever before. So these companies have actually developed two different techniques. And they’re rushing to commercialize each of them in the next year and a half. And they both say that their technique will work better than the others. One called HAMR– Heat-Assisted Magnetic Recording– Seagate’s approach. And it involves infusing energy from a tiny laser into these grains to make them easier to flip. And then the other one is called Microwave-Assisted Magnetic Recording or MAMR. That’s Western Digital’s approach. And it’s kind of the same strategy. It uses a microwave as an energy source in order to kind of stir up a little wobble in these grains and make them easier to flip as well. IRA FLATOW: Now, but in my laptop, though, the trend is to solid-state drives, right? Why not here? AMY NORDRUM: Yeah, so these drives– you’re right– have been around for a while. And in a lot of laptops and consumer technologies, solid-state drives based on flash memory are taking over. These do have a couple of advantages. They are certainly faster. And they don’t have any moving parts, so don’t have a disk in there spinning around that can get out of whack. But the truth is for large data centers, companies like Google, Apple, and Netflix that need to store lots of files that need to be accessed every kind of once in a while– still magnetic hard drives are much cheaper in the long run. So they’ll still be around, hanging out for a while in these big data centers. IRA FLATOW: But you’re saying it’s going to be a great upgrade in the amount of storage we have. How much? Give me an idea how much more. AMY NORDRUM: –next couple of decades, using these two techniques– they hope. IRA FLATOW: We’ll look forward to that. Your next story looks at a possible new particle collider at CERN. AMY NORDRUM: –in the world of physics this week. Right. So they have over there the Large Hadron Collider, of course, which discovered the Higgs boson a couple of years ago. But now, CERN is proposing a new particle collider. It will be four times as long as the Large Hadron Collider. And it’s called the Future Circular Collider. And right now, this is just a proposal. And they have designed plans that they’ve put together for this new particle collider. And it’s kind of on the drawing board, I guess you could say. IRA FLATOW: Kind of a boring name– Future Circular. IRA FLATOW: Ooh, that’s good. IRA FLATOW: I hope it’s not always in the future. AMY NORDRUM: Well, that can be the way that these projects go sometimes. Even if all goes well, it wouldn’t open until 2040. And the final phase of it probably wouldn’t be finished till around 2050. But the hope is for those physicists that are proposing this, that this would help you explore particles and discover particles at even higher energies than the Higgs boson and perhaps help fill out some of the holes that are right now in the Standard Model. IRA FLATOW: Because we’ve been– scientists have been disappointed in what they saw at the Large Hadron Collider so far. AMY NORDRUM: Yeah, they did find the Higgs boson. And that was big news, but they did not find any other new particles. And the Standard Model, which is sort of the way that physicists explain the forces and particles that work in the world, is still incomplete. It can’t explain things like gravity or dark matter. And we do need new research to dive into these areas. But there’s no guarantee if you build this thing that you’re going to find particles at those higher energies either. So it’s a little bit of a risk. IRA FLATOW: If you build it, they may not come. AMY NORDRUM: That’s very true. IRA FLATOW: China is also building a particle accelerator? Wow. AMY NORDRUM: Well, that’s another question, is, does the world need two of these? Because they’re quite similar in terms of their design and the way the stages at which both particle colliders would be rolled out. They’re even roughly the same size. So yeah, there are competing proposals out there for these types of colliders. IRA FLATOW: And you talk about hagfish slime. IRA FLATOW: I noticed you even tweeted about that one as something that you’d like to talk about. What’s the story about that? AMY NORDRUM: Well, hagfish– they’re also known as slime eels. So that’s kind of what they look like, too. They look like a large eel. They’re these very strange fish. And they have a really weird defense mechanism, actually. So when a predator like a shark grabs onto a hagfish, its response is to produce massive amounts of slime in half of a second. And that fills the predator’s mouth. And it allows the hagfish to kind of squirm away. So this is a weird phenomenon and an interesting one. And researchers over the years have tried to look at how this happens and what’s going on that helps them produce this much slime. So they know that it comes out of glands, and that there’s these fibers that sort of unravel that the slime is all wrapped around. But recently, a fluid dynamics expert got together with the materials engineer to kind of simulate this process. And they actually kind of settled on a better explanation of how the slime is actually deployed. And according to their models, they think that parts of the fiber that are embedded in this slime get stuck in the predator’s mouth. And that helps kind of unravel and pull the slime and its fibers out of these glands So it’s kind of a graphic thing to think about. But this slime attack happens in less than a half of a second. And it’s a pretty clever way on part of the hagfish to get away from something that’s trying to eat you. IRA FLATOW: And quickly, you have a story about the effects of screen time on kids. It’s not what we think it is. AMY NORDRUM: Yeah, there’s been a lot of conflicting research about this over the years, studies that have seen a negative effect from some type of digital technology use or maybe a slightly positive one. Most comprehensive study to date came out this week in Nature Behaviour. AMY NORDRUM: –well-being than this concept of screen time. IRA FLATOW: Well, that’s sort of good and bad news at the same time. IRA FLATOW: Amy Nordrum is news editor at the IEEE Spectrum. As we increasingly rely on artificial intelligence, we must prepare for new types of hacks.